If your ideal getaway involves a destination where you can play, eat, sleep (and play some more), move Branson’s Big Cedar Lodge to the top of your itinerary. 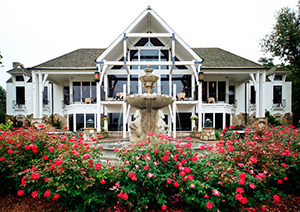 With activities for all ages, on-site dining, lodging options aplenty, convenient access to Table Rock Lake and one of the coolest golf courses in the Midwest, there’s no place quite like Big Cedar Lodge. Let’s start with the accommodations. At Big Cedar Lodge, the choices include one-room cottages complete with king beds and jetted tubs and two-bedroom cabins with nicely equipped kitchens. Find traditional lodge-style rooms (with king or queen bed options), luxury rooms that include a fireplace, and budget-friendly rooms with one or two queen beds. The Integrity Hills Cottage that sleeps six and includes three bedrooms and three bathrooms, while the Villa has an incredible 7,000 square feet of space, sleeps 12, has a home-theater setup, a billiards room and an outdoor fireplace. And you don’t have to be an elected official to enjoy a stay in the Governor’s Suite, which has four bedrooms and a pool room in its 2,500 square-foot layout. Now that you know a little about where to stay, here’s a look at places to play. First, tee it up at Big Cedar’s Top of the Rock golf course, home to the Bass Pro Shops Legends of Golf event since 2014. The par 3 course features spectacular views of TableRockLake, a signature island green and a beautiful stone church that welcomes players — and spectators — at the first hole. Next, enjoy an outdoors experience on the aforementioned Table Rock Lake when you take a sunset cruise on the Lady Liberty, rent a boat and explore on your own or take skiing lessons out of the on-site Bent Hook Marina. Interested in more terrestrial adventures? Head down to the Big Cedar Stables to take a pony ride, enjoy a wagon tour or have some quiet time with that special someone when you take a romantic carriage ride. And don’t miss the Ancient Ozarks Natural History Museum and the Last Canyon Cave and Nature Trail, both at the Top of the Rock (a short drive from Big Cedar’s main lodging areas). The museum has a fascinating collection of exhibits ranging from recreations of prehistoric creatures that once roamed North America to American Indian artifacts and items related to the Civil War. The Lost Canyon Cave Tour includes beautiful views of the rolling Ozark hills and the opportunity to stop for a drink at the Bat Bar inside the cave. Cedar Creek Spa has a variety of relaxing options to help you unwind after a day of fun – or you can totally pamper yourself and spend all day in luxury. 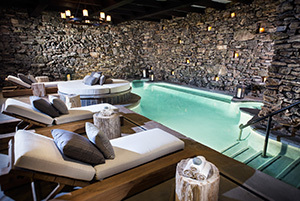 With options like the three-hour Signature Package (includes Swedish massage) or less time-intense treatments like the 45-minute facial, Cedar Creek Spa has you covered. With all the fun to be had at Big Cedar, you’re sure to work up an appetite. Fortunately, there are several on-site dining options to consider. The Worman House, open Thursday-Saturday, is a great dinner option with selections such as pan-roasted scallops and a grilled elk chop. The restaurant also has a very popular Sunday brunch. Devil’s Pool serves breakfast, lunch and dinner (and Sunday brunch), offering everything from trout and catfish to prime rib and Kansas City strip steaks in a more casual setting. And downstairs, stop for a drink at the Buzzard Bar, which features live music and has a diverse menu that includes some of the selections available at Devil’s Pool, plus classic bar fare such as chicken wings and pizza. For a morning pick-me-up, Truman Coffee and Café has smoothies, coffee, espressos and lattes, plus breakfast burritos. Later in the day, enjoy the light-fare menu featuring soups, salads and sandwiches. As if that weren’t enough, you find great Mexican cuisine inside Arnie’s Barn (as in Arnold Palmer) at Top of the Rock, which also houses the Osage Restaurant where the menu includes roasted halibut and prime ribeye. 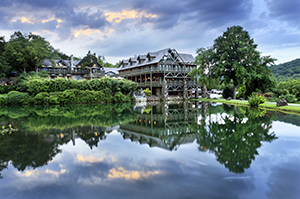 It’s fair to say there’s a lot to see and do — and eat — when you stay at Big Cedar Lodge. Take advantage of all this Ozarks escape has to offer and you’ll find why it’s one of the most popular resorts in the country.